devices can be used to provide videotex display conforming to a serial character attribute protocol. Ah - I wish I'd seen your post before cracking mine open - I don't think I have any chance of getting it back together! I can report that mine (1985 model) also has the SAA5231 but it has the SAA5240P/A in the 40-pin socket. as opposed to your 5243 here ("Enhanced computer-controlled teletext circuit (ECCT)"). Edit: did get it back together, but the retaining nut is now on the outside. Last edited by BigEd on Fri Oct 14, 2016 12:46 pm, edited 1 time in total. My case clips together, so it's tricky to take apart. These are more highly-integrated chips (requiring only two chips for a full decoder) but are still Level 1 (or possibly Level 1.5 because there's some support for an extended character set) rather than Level 2 teletext. The claim in the Morley ad that their adapter "will handle ANY future enhancements to the Teletext system" is of course ridiculous. Edit: but see below, this design uses the SAA5000 series chipset, just like Acorn's later adapter. Last edited by BigEd on Fri Oct 14, 2016 1:20 pm, edited 1 time in total. Lots of other ETIs on that site as well. Ah, thanks, and I see my mistake now - by 1979 you could use the SAA chips (by Mullard, aka Philips) and so this is not such an impressive TTL based design. Yeah, but a bit of a cheat using the new-fangled Mullard chips - much more fun in TTL! paulb wrote: Maybe the "on board Teletext display controller" and "second generation Teletext chip technology" can sink in before the chorus of naysaying resumes. Of course, had a market for high-resolution rendering of Teletext pages existed, those add-on makers could have done what Morley did when making their add-on for the Electron. In fact, from memory, the Morley add-on was also pitched at the Beeb and actually offered a higher level of support for the Viewdata standards than the Mullard IC in the Beeb, or this was at least a supposed selling point. Richard Russell wrote: I think it was pretty clear in the context of this thread (which is about the BBC Micro specification, not the Electron) that it was the former that was being referring to. The point there was that the CPC displays the Teletext pages without dedicated hardware, and for those who were interested in this (which from the "reviews" doesn't sound as if they expected it to be too many people) maybe the crude low-resolution rendering did the job. And none of the subsequent competitors, either. One might have expected the C64 to be oblivious to Teletext, being an American machine, but the Amstrad didn't have dedicated Teletext hardware in the base machine. (It did have adapters, though.) Yes, the resulting output isn't very nice, but the adapters could have done what the Morley adapter did on the Electron and couple the capability of obtaining data with the capability of displaying it nicely. All of which was merely exploring the possibility that Teletext display for the purposes of viewing broadcast text or dial-up services could have been done as an afterthought. No more than that. Not a statement on how wonderful mode 7 was as it was done on the Beeb, that it only used 1K, or whatever. Merely that, just like adding CP/M support through an accessory, people might have just done the same for Teletext. Not because people wanted to have a low-memory screen mode with low-resolution graphics, but because they might have wanted to use the services employing that display technology and would therefore have needed extra hardware anyway. Maybe they would have used the full Mullard chipset, maybe not. I only report that people tried it both ways. Richard Russell wrote: As regards "2nd generation teletext", Level 2 Teletext (which I am assuming is what you mean) did not arrive until 1988. Full-field teletext, as mentioned by Morley in the ad, is simply a higher speed delivery mechanism and doesn't have any implications for the display. I honestly don't care what Morley claimed. The only purpose those quotes from the advert served was to confirm that the adapter did Teletext display, contrary to what the naysayers were claiming. And thus, it illustrates that such solutions were completely possible and didn't have to compromise on any notion of how nice the display had to be. We didn't even get to consider the underlying motivations for the stipulation or the consequences, which is what seems to have provoked this increasingly narrow diversion, but whatever. Given that the task of putting the naysayers straight seems to involve the dredging of media archives for adverts and "reviews", only for people to misrepresent what has been written very clearly already in this thread, I rather do feel like I'm done wasting my time digging stuff up for people to read when they just shoot the messenger, anyway. Calm down Paul. No one thinks that you were making things up. There may have been a bit of confusion if someone did not read through the thread carefully, as to who was talking about what. There were teletext and Prestel adaptors and software for other computers. For the Atari ST, the display was software driven (choice of hi-res monochrome or medium res colour). Even though it was a 16 bit machine with much more memory than a Beeb, the teletext display from the Beeb was better. Later I got a PC television card, as part of that it also did teletext. Again, the display was software driven. Both the Atari ST and the PC worked well for using teletext. We're quite possibly finding different people talking about different things. For me, the launching point is the original 1980 document which mentions Teletext for low resolution graphics and colour display, to be mixable with colour medium resolution graphics. That would be in a context where Compukit-style ugly monochrome output might otherwise have been what turned up - like the ZX80 even - and a context where memory was expensive. So the spec sought to ensure the machine was nice enough to use on a TV display. Of course the BBC as a broadcaster would have seen Teletext as important, and display quality as important. By the time the Electron came out, and Morley offered their Teletext adaptor for both teletext reception and for Mode 7 display, quite some time had passed, and the expectations for video output would have moved on quite a bit. Looks like the ad Paul posted was June '86. If we are talking about remote controls for teletext, that is moving away from the subject, can I suggest a new thread. Edit: new thread TTL teletext decoders and early remote controls. Going back to the outline specification, what would have been interesting, is if no manufacturer had offered a teletext display. After all, at first Acorn offered a modified Atom. That is, how much importance were the different elements of the outline specification? Would a computer that could do "medium resolution" graphics and a 40 column text display (say 8 X 8 pixels) have won if the other manufacturers could not offer anything better? You're quite right that the "for the Electron" qualification didn't sink in at the time, but I haven't seen any evidence that it was "also pitched at the Beeb". The SAA5050 chip provided 100% support for the 1976 Teletext Specification, which was all that was being broadcast at the time, and the chips in the Morley didn't provide any extension other than, possibly, support for some foreign-language characters. Personally I don't see the point of speculating on what might or might not have happened had the BBC's specification not called for a teletext-capable display. Since teletext TVs existed, the possibility of supporting teletext acquisition and display capabilities in an add-on unit is obvious; it doesn't require the existence of the Morley Adapter as confirmation. The fact is that the BBC did make that stipulation. Teletext was after all invented by the BBC and new applications, such as telesoftware, were actively being developed concurrently with the Computer Literacy Project. Given the advantages of a teletext display in respect of text quality and small memory footprint, and the possibility of supporting Teletext and Videotex services like Prestel via external adapters, I don't find the decision to require that capability at all surprising. The information provided by schools included both photographs and text, and my recollection is that the textual content was displayed in MODE 7. But I can't be certain, and the only way of ascertaining for sure (in the absence of evidence from screen shots) would be to run up a working system - and I'm not sure there are any left (keeping the Helium-Neon lasers going was a real problem). It may be that the Camileon emulation would be another way of finding out, but I don't think that is available now either. Sorry I can't be more definite, but my association with that project back in 1986 wasn't as close as it had been with the BBC Micro. My more recent involvement with Domesday was in the transfer, in 2003, of the images and maps from the videodiscs to a more secure long-term storage format via the Transform PAL Decoder (specially modified for the task). There are details here. BeebMaster is the best person to ask about BBC Domesday System hardware. 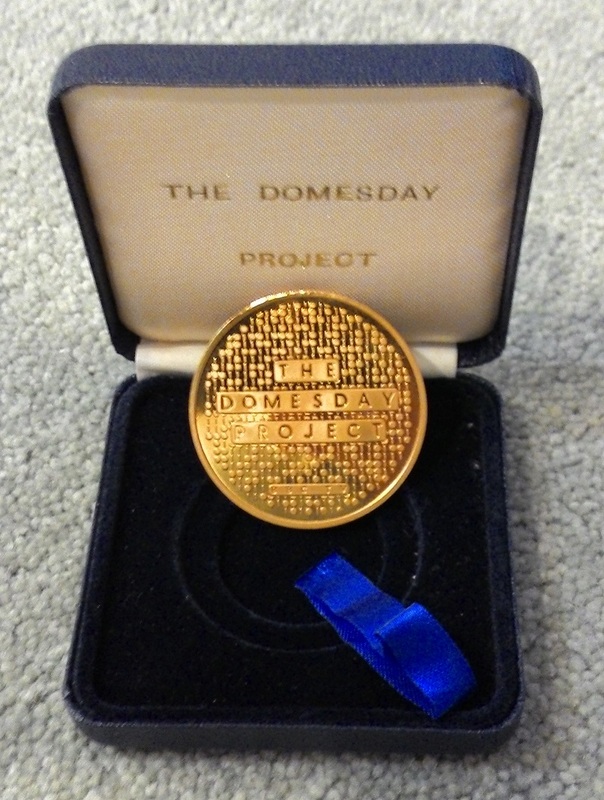 See http://www.beebmaster.co.uk/Domesday/DomesdayHome.html. BigEd wrote: We're quite possibly finding different people talking about different things. For me, the launching point is the original 1980 document which mentions Teletext for low resolution graphics and colour display, to be mixable with colour medium resolution graphics. That would be in a context where Compukit-style ugly monochrome output might otherwise have been what turned up - like the ZX80 even - and a context where memory was expensive. So the spec sought to ensure the machine was nice enough to use on a TV display. Of course the BBC as a broadcaster would have seen Teletext as important, and display quality as important. Given that they were also bidders, I wonder how much of this influenced Tangerine's design of the Oric. I've just been reading about it and it's a bit of an oddball — the starting position is a text grid with serial control codes ala Videotex, but codes exist to switch in and out of graphics mode, in which case the ULA changes address calculation and instead of reading character codes to look up pixel data, it just reads 1-bit pixel data. Except that the pixel data can also instead be control codes, so you get only six pixels per byte. Since character forms as also in RAM, the system uses a 2Mhz-rated 6502 that it runs at a total of 1Mhz but each phase-1 is twice as long as each phase-2, potentially to squeeze in two RAM accesses before the CPU gets its go. ... all of which sounds to me like a design that one can probably justify in oddness and complexity only by being extremely enthused about creating a mixable teletext-style and colour medium-resolution graphics display. 1024MAK wrote: BeebMaster is the best person to ask about BBC Domesday System hardware. Interesting site, but it looks as though he was not aware of the BBC's own efforts to preserve the data and video, which had already happened by the time he was working on it. And of course the BBC had access to the master tapes from which the videodiscs had originally been created so at least one generation fewer in quality and - most importantly - recorded in 'mathematical PAL' making Transform Decoding possible. ThomasHarte wrote: Given that they were also bidders, I wonder how much of this influenced Tangerine's design of the Oric... which sounds to me like a design that one can probably justify in oddness and complexity only by being extremely enthused about creating a mixable teletext-style and colour medium-resolution graphics display. Tangerine Computer Systems had already created the successful Microtan 65 computer and was working on a new computer and an adaptor to work with the BT Prestel service. This put it in a good position to provide the teletext adaptor required in the specification. Richard Russell wrote: Interesting site, but it looks as though he was not aware of the BBC's own efforts to preserve the data and video, which had already happened by the time he was working on it. And of course the BBC had access to the master tapes from which the videodiscs had originally been created so at least one generation fewer in quality and - most importantly - recorded in 'mathematical PAL' making Transform Decoding possible. I assume the video data was analogue, then? I am sure I also read about the BBC's efforts and the article concerned said that this had only been possible because someone who had been involved the project in the first place had "archived" the tapes in his loft. If true the "of, course" part of having access to the master tapes is not a given. 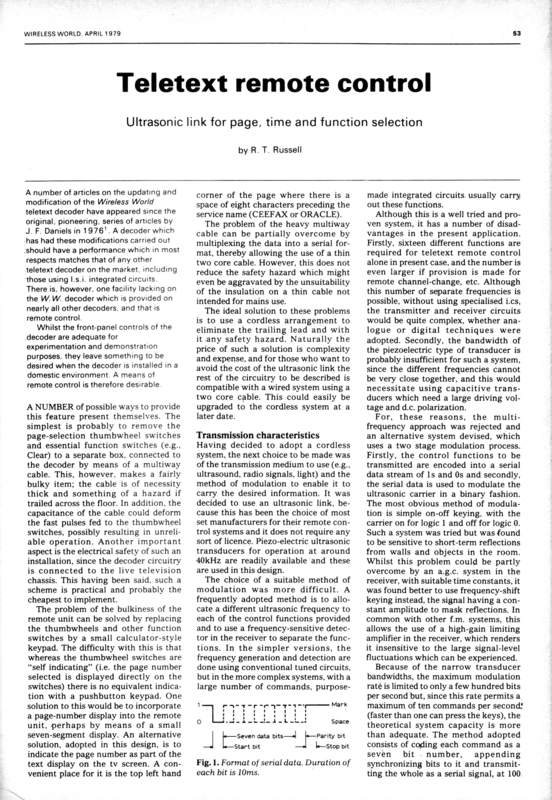 I think it is probably also fair to say that much was made of the possibility of the Domesday data being lost forever and, in typical press fashion, this scare story received much more prominence than the subsequent success so it is probably no surprise that BeebMaster was unaware of it. Coeus wrote: I assume the video data was analogue, then? Digital video recording didn't really exist then; the first digital tape format (D1) arrived in 1986, too late for the Domesday project (and it was never a very practical system anyway). This is what it says at the site to which I linked previously: "In mid January 2003, the original 1-inch C format analogue videotapes - to be exact, masters for sides 1,2 and 3 and a safety-master for side 4 - were copied onto D3". I am sure I also read about the BBC's efforts and the article concerned said that this had only been possible because someone who had been involved the project in the first place had "archived" the tapes in his loft. Don't believe everything you read! Again, from the linked site: "The master tapes for the Community Disc and for one side of the National Disc had been stored safely away since 1986 by, firstly, the BBC's Open University Production Centre and then by Domesday head Peter Armstrong. (Neither in his loft or his garage but in his office at home.) A safety master of the fourth disc side was also found in the BBC Worldwide vault". Richard Russell wrote: The 'difficult' aspects of the Videotex/Teletext standard are implemented within the SAA5050. Ooo, I have a copy of that issue! Edit: And the ETI one. Last edited by jgharston on Fri Oct 14, 2016 8:26 pm, edited 1 time in total. paulb wrote: Maybe the "on board Teletext display controller" and "second generation Teletext chip technology" can sink in before the chorus of naysaying resumes. I guess I could try and dig up a "review" from Electron User where they actually mention this, but since nobody will bother to read it, it would be wasted effort. Ah, that's an ELECTRON teletext system which is a combined broadcast teletext aquisition system plus a MODE 7 extension. It's an ordinary bog-standard Morley teletext aquisition system combined with a Jafa MODE 7 system in the same box. The Electron doesn't have MODE 7, so to display teletext you either approximated it in software with a bitmap screen mode, or added extra hardware to bring it up to the BBC' capabilies. It's still just the hardware displaying the picture though, displaying a MODE 7 teletext screen has absolutely nothing to do with aquiring broadcast teletext data. You don't need to be able to pull broadcast teletext data out of the air to be able to display a teletext screen. The Jafa MODE 7 extension doesn't magically give you the ability to aquire broadcast teletext data. You don't need to be able to display a teletext screen to be able to pull broadcast teletext data out of the air. The bog-standard normal Morley teletext aquisition system doesn't magically give you the ability to display teletext in hardware. The example you pointed to just happened to combin both functions in one box. It's like saying "my USB interface lets me plug in a hard drive!" No it doesn't. Your combined USB/IDE interface lets you plug in a hard drive. Edit: getting to the end of the thread I notice other people have already made these comments. On the subject of adding a hardware teletext display (aka MODE 7) to non-Beeb systems, I sketched out an add-on for the Spectrum to do this. Never got beyond fairly detailed schematics which I probably still have somewhere. Richard Russell wrote: Seven companies were contacted by the BBC, of which six actually submitted proposals: Acorn, Nascom, Newbury, Sinclair, Tangerine and Transam. It's quite possible that the seventh company might have been RM, but unfortunately none of the contemporary documentation I have mentions who it was. Tilly Blyth's NESTA report confirms it (page 12): "The BBC team approached seven companies (Acorn, Tangerine, Newbury, Research Machines, Sinclair, Transam, and Nascom) to submit bids to build the BBC Micro". RM was the only one not to submit a bid. It is riddled with errors and misunderstandings. Last edited by CHRISJJ on Sun Oct 16, 2016 12:28 am, edited 1 time in total. "got its first public airing at the Personal Computerworld [sic] show this week." My desk carries a memento of that event. From one of the demo BBC machines, the heatsink I removed from the overheating video ULA so I could directly reach the chip with freezer spray. CHRISJJ wrote: It is riddled with errors and misunderstandings. I can't claim to have read all 78 pages, but I've not noticed any glaring errors in what I have read. In fact I would say it's considerably more accurate than some accounts based on myth and hearsay; not surprisingly because much of what she writes was derived from interviews with those involved at the time, so comes 'from the horse's mouth'. Rather than simply throwing dirt, would you care to identify some of the "errors and misunderstandings" that you refer to? I am in contact with David Allen, so between his personal recollections and mine, and before I put my box of contemporary documents back in the loft (! ), it may be possible to establish the 'facts' for everybody's benefit. CHRISJJ wrote: the heatsink I removed from the overheating video ULA. Call me a pedant if you like, but the ULA didn't "overheat", rather it stopped working at a temperature below what it would normally be expected to run at. Although at the time the issue was sometimes portrayed as a manufacturing problem at Ferranti, I think even the ex-Acorn engineers would acknowledge that in reality it resulted from trying to push the chip beyond its official performance specification. It was arguably bad luck that the prototype ULAs worked, when they were not guaranteed to, but one should not establish reliability by testing alone, but rather by design. To be fair to Acorn they were being pushed to the limits to turn out a complex design very quickly, so taking some unwise shortcuts is perhaps understandable. Richard Russell wrote: To be fair to Acorn they were being pushed to the limits to turn out a complex design very quickly, so taking some unwise shortcuts is perhaps understandable. And we used a couple of these ULAs on the BBC Micro. They were known as the vidproc and the serproc, which stood for the video processor and the serial processor. The video processor was the thing that had the colour lookup tables and was used to define the colour of pixels on the display. And that had to operate at sixteen megahertz in the fastest display mode and that’s where it struggled. It was fine at eight but at sixteen it got a bit noisy and it – the computer lab had actually done the metallisation design for us using tools they’d developed and they’d actually implemented a very early form of wave pipelining in this colour table lookup. But the real problem with the video processor was the fact that these logic gates changed speeds spectacularly between when they were first switched on and when they got to temperature. And their operating temperature was quite hot. But basically the logic gate delay would change by a factor of two between room temperature and operating and the wave pipeline approach was not able to accommodate that much variability. Last edited by BigEd on Sun Oct 16, 2016 9:50 am, edited 1 time in total. My concern may be misplaced - it's very hard to judge tone from text - but just a reminder to please please keep the tone in this really interesting, and important, thread civil! Richard Russell wrote: The information provided by schools included both photographs and text, and my recollection is that the textual content was displayed in MODE 7. But I can't be certain, and the only way of ascertaining for sure (in the absence of evidence from screen shots) would be to run up a working system - and I'm not sure there are any left (keeping the Helium-Neon lasers going was a real problem). Several of us on here have working systems although they are quite temperamental!